Earlier today was the start for the Pre-Dawn Mass aka Simbang Gabi, Misa De Gallo(Misa de Gallo is the Spanish phrase for Midnight mass). Marks on our culture and only in the Phillipines that this custom lasts for nine days(like in novenas), starting on December 16 up to December 24, usually starting at around 2:00-5:00 a.m. This practice started during the Spanish colonial period centuries ago when priests held early dawn masses for the farmers who wanted to attend Christmas mass but could not leave their fields. 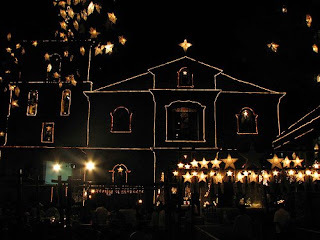 These masses were held before daybreak, hence the Filipino term "Simbang Gabi" (Midnight Mass). 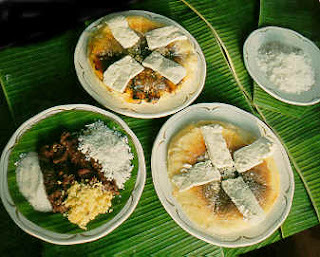 And still alive today, we have this colourful custom to wake up at early dawn for nine consecutive days to attend mass and eat culture-savoured foods(Traditional Filipino foods, such as puto bumbong (a purple colored rice pastry, seasoned with grated coconut and brown sugar),tsokolate (a hot cocoa drink), bibingka (flour and egg cakes cooked on top and under), and salabat, or ginger tea) after the mass celebration. 4 comments: on "Misa De Gallo or Simbang Gabi(Pre-Dawn Mass)"
nindot na nga maikumpleto kai according to them one of your whishlist will come real, though sa akong part wala ra man ko nag mind nga ma true ako wish, ako lang is its a form of sacrifice inspite of having been busy we can still have time for HIM. good luck sa completion! It's very nice to complete the dawn mass. i tried it once and my wish granted. Maybe my wish was granted because I'd sacrifice and waited for it. For example, if we want to have a highest grade we must study hard to have it. Kumbaga kailangan nating magsunog ng kilay. As a youth pateince and perseverance is very important now a days. If you want something pray for it and it will be given to you, if not maybe God has a reason and purpose. Wait and you will see.